The Conservatives have come under fire after David Cameron pledged to give people the chance of a “good life” by extending Margaret Thatcher’s right-to-buy scheme to 1.3 million families in housing association properties. 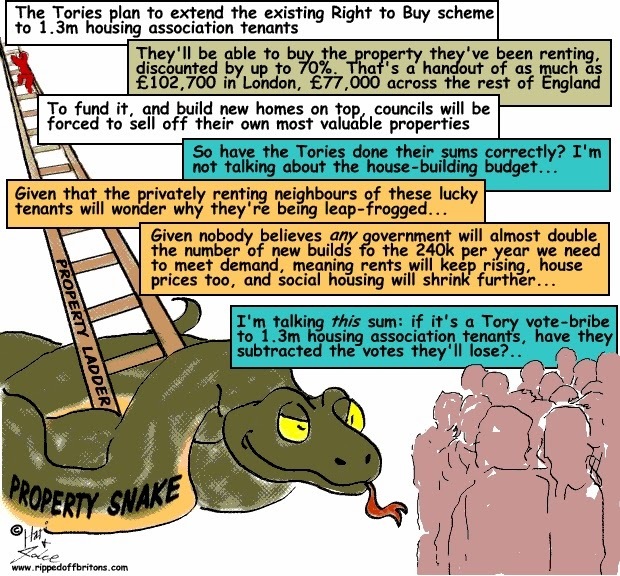 The Confederation of British Industry and the blue chip Jones Lang LaSalle (JLL) property firm joined many housing associations, warning that the Tory plan would not address the chronic shortage of housing. Boris Johnson said last month that the proposal would involve massive subsidies. Adam Challis, head of residential research at JLL, said: “The expansion of right to buy may be good politics, but represents terrible policy. This is exactly the kind of short-termist thinking that the country’s 4.7m households in social housing don’t need, not to mention the same number again of aspiring owners in private renting”. Gavin Smart, the deputy chief executive of the Chartered Institute of Housing, warned that the proposal could make life more difficult for people on lower incomes, adding: “We fear the figures simply won’t stack up.” Under the Tory plans, councils would be forced to sell off their most valuable homes, to be replaced by affordable housing in the same area. The funds from the proceeds of the council house sales would be used to pay for the extension of the right-to-buy scheme to housing associations. A further £1bn from the sales would be used by the Tories over four years to prepare brownfield sites for house building, with the aim of creating 400,000 extra homes. The Tories said around 15,000 council properties that are in the top third price bracket – around 0.4% of the stock – become available every year. Under the new rules, councils would be forced to sell those homes, raising £4.5bn net a year. This would be used to fund the building of cheaper, replacement properties. “That is more than enough to pay for one-to-one replacement of the council houses sold, discount for the right-to-buy housing association property, one-to-one replacement for the right-to-buy homes and this £1bn over four years fund to deal with brownfield sites,” one Tory source said.